These tree drawings and photos will identify good tree structure for shade trees. 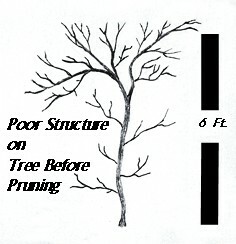 Poor structure is a leading cause for structure failure later in the tree's life. Good structure can add years to a tree and is very important for beauty and strength. This page identifies 4 structure problems shown below and offers tree pruning tips for pruning upright trees, how to prune fruit trees, and how to prune young shade trees. Not all nurseries do a good job at pruning trees. As a tree grows larger, its structure becomes even more important. Poor tree form can be a safety hazard, can result in serious structure failure, or can generally weaken the tree. Producing a good shade tree from liners (bare root stock) or from a nursery tree is really not that difficult. Once you know how to identify the problems, proper tree pruning is much easier. A single trunk that forms a central leader well into the canopy. 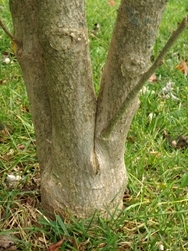 A straight trunk with good caliper (trunk diameter). Properly pruned tree that began (hopefully) in the nursery, but at least since the time it was planted. Tree should have strongly attached branches. 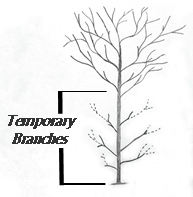 Weakly attached branches can be removed or pruned back for safety. Trees don't always develop good structure on their own. Some varieties are more prone to this than others. Below are some types of structure problems. These will also be explained on this page. Below are 4 important conditions to look for in pruning shade trees. These four conditions are explained below here in greater detail. Problem 1: Codominate or Competing Stems: Branches the compete for dominance with the leader. Problem 2: Included Bark: Weakly attached stems having "included bark". Strong branch unions will have a "branch bark ridge" and a "branch collar" that hold branches firmly to the tree. 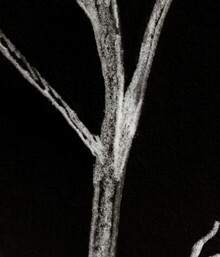 The tree drawing slightly above shows a weak branch attachment (included bark) where the branch attaches to the trunk. Problem 3: Slowly Growing Leader: The primary Leader grows more slowly compared to other branches, which may allow a secondary branch to become the dominate leader. Problem 4: Insufficient Trunk Caliper: created by removing all the lower branches on young trees. These trees will often need to be staked or can break too easily in the wind. These four Problems are explained below. Codominate stems can be found anywhere on the tree, from the base to the middle canopy. They usually form early in the life of the tree. Here are a few characteristics that accompany codominate stems. Codominate and competing stems that are at least half of the diameter of the trunk will often form weak attachments. Competing stems grow at basically the same rate as the leader with similar branch diameter. 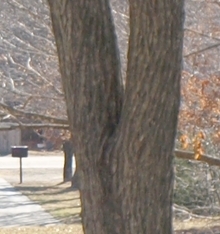 Problematic branches are often lacking a branch collar or branch bark ridge that forms the strongest attachments to the tree. These limbs can be in danger of breaking as the tree grows larger, which can destroy the tree's form and shorten its life. The tree photos below are examples of codominate stems. The codominate stems in the middle picture are attached more strongly than the trees in the other pictures. Codominate stems form branches of equal size and growth rate often originating from the same spot in a tree. Competing stems are stems that compete for dominance with the leader and should be pruned back. They may be located at different points on the tree. 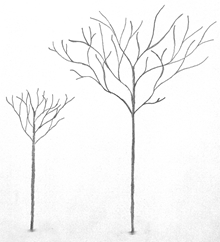 These drawings are of young trees up to a few years old. While you can use these same techniques in older trees, it is easier to correct problems while the tree is still small. The tree drawing at the left shows a small tree that has two codominate stems. If allowed to grow the tree will eventually suffer damage as one stem pushes against the other until one breaks. Cutting the stem in the manner shown while the tree is young will fix the problem. How to prune: Cut the stem at the base of the branch at a slight angle if no collar is present. Do not leave a stub. If there is a branch collar, cut the branch just above the collar which may leave a short stub. The collar appears as a slightly swollen area at the base of the branch where trunk fibers and branch fibers overlap each other. 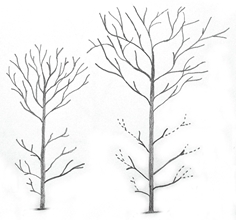 The three drawings above from left to right are an example of how a young upright shade tree can be pruned to produce the proper for a large shade tree needs. 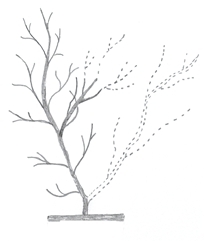 The left tree drawing above shows a small tree before it is pruned. The leader is growing in an arch and a second branch is competing for dominance. Bad structure in young trees are more easily corrected than in older trees. 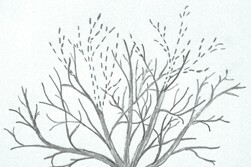 The middle tree drawing shows dotted lines indicating the removal of branches. Notice, the lower branches are not removed, but are only shortened. Keeping the lower branches on the tree for four or five years will slow the vertical growth while increasing trunk caliper. This is important for tree strength. 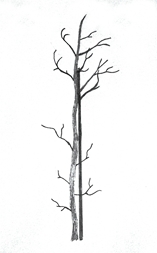 The third tree drawing above shows the remove of the competing stem followed by staking to straighten the tree. Additional branches may be cut to balance the tree canopy. In the tree drawing to the left, a young tree had developed a competing leader near the bottom of the trunk. To correct the problem the bottom stem needs to be removed. The longer stems in the center of the tree should also be shortened to balance the tree and to slow the growth of those particular branches. This will prevent them from became too large and competing for dominance with the main leader. The tree is leaning to the left and can also be straightened and held in place with a stake. To see how this is done, please refer to the drawing above showing the staked tree. 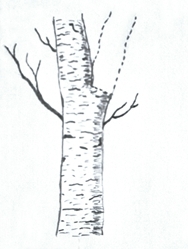 Included bark, as shown in the tree drawing picture on the right, is the term referring to weak branch unions that lacks a branch bark ridge that indicates a strong attachment. Instead, tree bark becomes trapped between the branch and tree trunk. These are most often found on branches with 60 degrees or greater angle to the trunk. These branch unions often have no branch collar or branch bark ridge. In comparison, strong branch unions have will have a branch collar and a branch bark ridge. The collar and bark ridge indicate interlocking fibers that overlap with branch fibers to hold the branch on tightly. If possible, remove or shorten branches with included bark. The branch will then take a less important role in the tree. The first two photos above show two similar types of crotches. Both are "V" shaped, but the first is much stronger since the stems are not pushing against each other. The second tree is in danger of splitting as the tree grows larger because the stems are pushing against each other. "U" shaped crotches are much stronger than "V" shaped crotches. 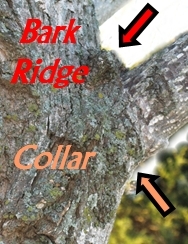 The third photo shows what a branch bark ridge and a collar looks like. The bark ridge is a raised strip of bark where overlapping fibers meet. The collar is a swollen area where the branch meets the trunk and also indicates where trunk fibers and branch fibers interlock. Shade trees, fruit trees, and many upright trees should be pruned to a Central leader. What if the secondary leaders are growing faster than the central leader? You need to prune back the secondary leaders, a process called "subordination". 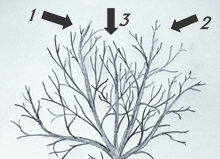 The above tree drawings show a tree with the central leader #3 growing slower than the secondary stems #1 and #2. Since you want the central stem to be the primary leader, you will need to shorten the two secondary stems which will slow their growth. The tree drawings above is the the same tree showing where the cuts are to be made on the outside secondary leaders. By removing a portion of the stems, the growth of the secondary leaders are slowed, but the primary stem that is left uncut should pick up height on the next grow spurt. The word "caliper" refers to the thickness of the trunk. Trunk caliper is measured six inches from the ground on young trees, and one foot from the ground on mature trees. Young shade trees will benefit from having a strong thick caliper. You build good caliper by leaving the lower temporary branches on the tree for three to five years. They can be shorten during the first few years and then removed a couple years later. This slows the vertical growth, while increasing the trunk width. Note: Many commercial nurseries will remove the lower temporary branches on young trees to speed vertical growth. This allows the tree to be sold at least a year sooner often at the expense of good trunk caliper. Due to a narrow trunk caliper, many of these trees will need to be staked to keep them from bending or breaking. 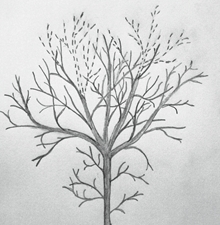 Each of the two tree drawings above show a tree in year three and five. 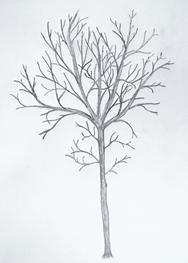 The first tree drawing shows a complete removal of lower temporary branches leaving only the permanent branches. Trunk caliper remains narrow even though the tree has grown taller. 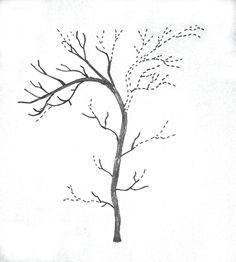 The second tree drawing shows temporary branches that have not been removed. They were shortened between year's 3 and 5. They can later be removed completely. Tree caliper is good and vertical height is slightly shorter than trees where the temporary branches have been removed. While not rocket science, there is a lot more to planting a tree correctly than digging a hole. This page covers everything you need to know from choosing the planting location to amending the backfill soil. How deep is too deep? Most people plant their trees too deeply and thousands of trees die every year as a result. Find out how to determine the correct depth and how to fix any problems. 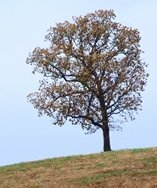 Lawn Care Academy's Tree Care landing page offering helpful information and links to our other tree care pages.